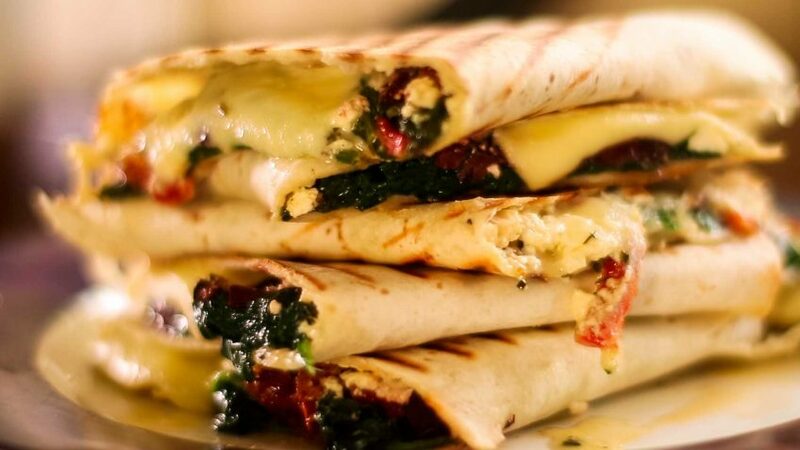 A simple and easy to make Quesadilla Greek style recipe. Make it under 20 minutes, a perfect lunch with a side salad. Also a great vegetarian meal. In a frying pan on high heat, add a drizzle of olive oil. Once oil is hot, add the spinach leaves and cook 20-30 seconds until wilted. Leave aside. Lay out the tortillas on a bench, mince and spread the garlic all over the facing side of the tortillas. Add the crumbled (use your fingers) feta cheese. Add the sundried tomato strips. Slice and add the olives. Chop the oregano and sprinkle all over. Top with the wilted spinach, season with pepper (no need for salt as olives and feta is salty) then fold over. Life with a spatula, or egg flipper and place on a griddle pan, turn on the heat to very low and cook until toasted. Flip over and cook other side. (Just lift and peek underneath to make sure it’s golden brown and not burning). Slice in half and enjoy immediately with a salad.